Only thirty two pages are the blame of the incredible Indignez-Vouz editorial success. Through them, an ancient, brave and wise man, survivor of one of the darkest periods in human History, appeals citizens to the “pacific insurrection”, for rebelling against a system that each and every day gives several awards to injustice, insolidarity and intolerance. The author of this allegation is Stéphane Hessel, the one of the original Universal Human Rights Declaration editor that is still alive. He was born in 1917 in Berlin within a jewish family, so the nazis´s victory forced his family to move to France. Hessel knows the meaning of commitment: he joined De Gaulle´s free France in London until his undercoverhomecoming in 1944 to Paris, when Nazis had just taken the power. 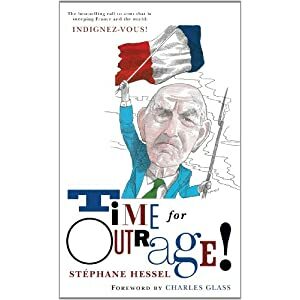 The years lived beside the french Resistance members, his almost deathly experience in Buchenwald’s concentration camp and the fight against fascism, gave Hessel a clever point of view about what kind of world should be built. At the end of the Second World War, while the United Nations were been created, he was chosen as member of the Universal Human Rights Declaration editors team. Hessel describes an ‘atrocious drama’ in 1945, a very hard situation that the Resistance Council had to face with an ‘ambitious resurrection’. It was at this time when a full plan of Social Security was born, bringing some of the most important goals of Wellfare Sate: the assurance of the livelihoods for all citizens, the access of children to a good public education and the retirement for old people ‘that allows ancient workers end their days with dignity after a long life working’. Up to date, they are being questioned. Other measures were been taken, as the nationalization of the big media production, energy sources and banks, led to a ‘real social and economic democracy’. The general interest was over private interest. And, of course, and authentic democracy needs a free press. ‘How is possible that there are no money enough to save this democracy goals’, wonders Hessel, ‘when richness production has been increased since the end of the Second World War?’. Hessel focuses much of his book to talk about United Nations. This organization ,created for the maintenance of peace and the Human Rights defense, is not respected nowadays. For example, according to Hessel´s book, Hitler was defeated through the belief in universal condition of Human Rights and that no dictator could make his will without be punished. Since World Trade Center attacks, the world would never be the same: the rules changed and anything goes in order to catch the bad guys. So what Hessels ask for, not only his readers but any person, is not closing their eyes. ‘The reason of oppositions is indignation’, says this 93 years old man. He fingers two great challenges: the increasing huge gap between rich and have-nots and the human rights and their situation in planet. At his point, Hessel is very worried about the emergency of palestinian people –in fact he recommends reading Richard Goldstone Gaza’s report where this jewish, even zionist, judge denounces Israelite army by crimes against the humanity-. Sorrowfully Hessel writes about unresolved facts, about the damages of a wrong globalization, where the only thing that is running free is money while culture, health and education don´t spread nor reach those who need them most. Hessel´s is not the first capitalism impeachment, but the clearer, because he bases his arguments in his own life experience. A 93 years old man has lived so much and knows what is he talking about. Remaining indifferent to this situation is the worst thing we can do now. More than half a million of readers in France have been caught by this message, in one of the countries that more have expressed its indignation against the crisis, its consequences and its causes. Even a french youth movement has been born, because young people are the target of this book –that in France costs only three euro for making it more accessible-. For Hessel, future generations have to look after social and economical achievements whose are at risk right now. ‘To young people I say, look around and you will find reasons to outraged’, says the writer. ‘When you are indignant by something then you became in a militant, strong and implicated. You are part of the History flow, that tends to more justice, more freedom, but not in an uncontrolled way’, Hessel adds. But maybe this wise and full of meaning words sounds like the words of a grandfather. Unfortunately, current young people speak another language, social network language. They only know Nazis and concentrations camps and war by movies and TV. They have grown up with Facebook, and Nike and Coke; they have another worries and problems so they need brighter slogans that could approach them to the reality. This generation is going to inherit a society more precarized than their parents and their silence, their conformism is astonishing. What is really happenig with them?. Maybe is just a matter of speak about work thrash, lack of opportunities and so on. Maybe someone press the apopiate key and then young people attitude changes. At the end of the book Hessels gives us a good advice: ‘”those who will build the XXI century, we say them, with all our affection, CREATE IS TO RESIST. RESIST IS TO CREATE’. Let´s think about it.